BRAVO is bringing a new twist on chef competitions to viewers with a development project in the works with celebrity chef Rocco DiSpirito called “Rocco’s Dinner Party”. The reality competition show has DiSpirito testing up-and-coming chefs at their cooking and creative skills at a dinner party consisting of his “discriminating guests”. According to a press release, each episode will feature four different chefs who will be tasked to create their favorite dish for Dispirito. Each task will end with an elimination by DiSpirito. The three remaining chefs will compete by creating an appetizer, and propose a menu for the given theme. The third chef is eliminated based on this task. The final two chefs will compete for a cash prize based on how well the dinner party guests like their menu and ambiance according to the dinner theme. Competing chefs are promised to come from “all walks of lives’ from restaurateurs to caterers to self-taught”. 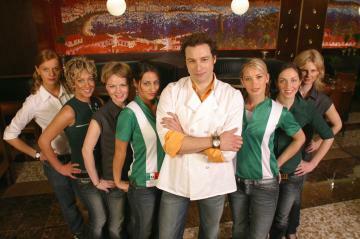 DiSpirito, who competed on season seven of “Dancing With The Stars”, past reality show produced by Mark Burnett was NBC’S “The Restaurant”. The show had similar real-life challenges as the ones seen on Gordon Ramsay’s “Kitchen Nightmares” but was done in an appealing docu-drama style. “The Restaurant” sadly, only lasted two seasons due to the closing of the actual restaurant “Rocco’s on 22nd Street” because of financial hardship. I’m looking forward to this new DiSpirito food show.